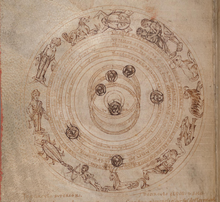 The use of astronomical symbols for the Sun and Moon dates to antiquity. The forms of the symbols that appear in the original papyrus texts of Greek horoscopes are a circle with one ray ( ) for the Sun and a crescent for the Moon. The modern Sun symbol, a circle with a dot (☉), first appeared in Europe in the Renaissance. The symbols for Uranus were created shortly after its discovery. One symbol, , invented by J. G. Köhler and refined by Bode, was intended to represent the newly discovered metal platinum; since platinum, commonly called white gold, was found by chemists mixed with iron, the symbol for platinum combines the alchemical symbols for iron, ♂, and gold, ☉. This symbol also combines the symbols of Mars (♂) and the Sun (☉) because in Greek mythology Uranus represented heaven, and represents the combined power of Mars's spear and the Sun. Another symbol, , was suggested by Lalande in 1784. In a letter to Herschel, Lalande described it as "un globe surmonté par la première lettre de votre nom" ("a globe surmounted by the first letter of your name"). 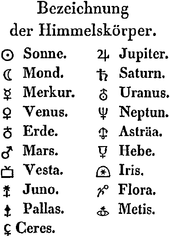 Several symbols were proposed for Neptune to accompany the suggested names for the planet. Claiming the right to name his discovery, Urbain Le Verrier originally proposed the name Neptune and the symbol of a trident, while falsely stating that this had been officially approved by the French Bureau des Longitudes. In October, he sought to name the planet Leverrier, after himself, and he had loyal support in this from the observatory director, François Arago, who in turn proposed a new symbol for the planet ( ). However, this suggestion met with stiff resistance outside France. French almanacs quickly reintroduced the name Herschel for Uranus, after that planet's discoverer Sir William Herschel, and Leverrier for the new planet. Professor James Pillans of the University of Edinburgh defended the name Janus for the new planet, and proposed a key for its symbol. Meanwhile, German-Russian astronomer Friedrich Georg Wilhelm von Struve presented the name Neptune on December 29, 1846, to the Saint Petersburg Academy of Sciences. In August 1847, the Bureau des Longitudes announced its decision to follow prevailing astronomical practice and adopt the choice of Neptune, with Arago refraining from participating in this decision. The symbol for 4 Vesta was invented by German mathematician Carl Friedrich Gauss. Dr. Olbers, having previously discovered and named 2 Pallas, gave Gauss the honor of naming his newest discovery. Gauss decided to name the new asteroid for the goddess Vesta, and also designed the symbol ( ): the altar of the goddess, with the sacred fire burning on it. Other contemporaneous writers use a more elaborate symbol ( ) instead. Symbols for a comet (☄) and a star ( ) have been used in published astronomical observations of comets. In tables of these observations, ☄ stood for the comet being discussed and for the star of comparison relative to which measurements of the comet's position were made. This page was last edited on 7 April 2019, at 13:32 (UTC).